The nominal Mission of the Mission was San Francisco de Asis and founded by Spanish Franciscans in 1776, but Yelamu Indians inhabited the area around Mission Creek for thousands of years before that. Take a mural tour with Precita Eyes, a nonprofit thatʼs been the neighborhoodʼs chief street art advocate for decades. Check out our Mission History page. 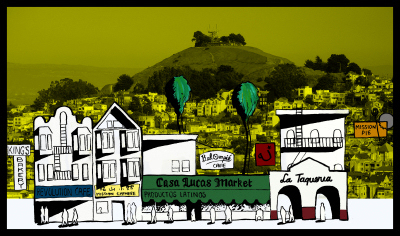 For a good walking tour, take a peek at our map of Mission history and art history. Found SF also has a nifty online archive of Mission history. Don’t unwrap the foil all the way. Peel as you eat to keep structural integrity intact, otherwise you’ll end up with carnitas juice all over your hand like a total noob. 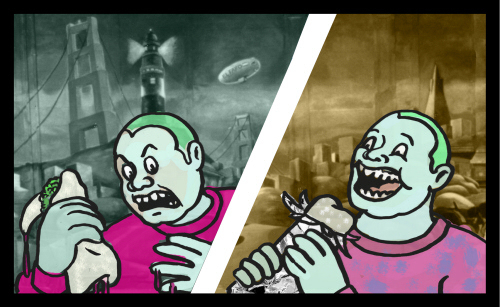 There’s more to the Mission than burritos, and the choices can be overwhelming. 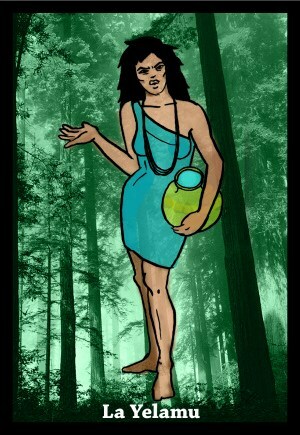 Lydia: These days I’m thinking about trying new placesand consult Maria’s latest reviews. Of course, there are our neighborhood favorites including Papalote for killer prawn tacos and Mission Pie for scrumptious stews and if we’re feeling like a warm caldo San Jalisco. And Tartine Bakery’s bread is an ongoing must. (Check out my occasional food column Perfect or Not). Andrea: Arizmendi. It’s a great bakery so I always try to be careful of what I purchase or it can be dangerous… My favorite part is dipping the crust in what’s left of my coffee (Check out our video profile of this worker-owned bakery).). Mark: The Spice Jar. Taken over from Local’s Corner. They make a mean spicy chicken miso ramen and the shu-mai were to die for. The rest of the menu looks as good as these dishes tasted.). Laura Wenus: The friendliest people are at Atlas Cafe. If I’m having a horrible day, a latte at Atlas on the patio with a magazine will get me through it. Also their bread is phenomenal. For date night, Cafe Ethiopia is my go-to, because who doesn’t love sharing a plate you can eat with your fingers? As far as group outings go, it’s all about Bender’s,for booze and bar bites (sometimes really cool local pop ups too!). Laura Waxmann: When pressed for time, the Royal Cuckoo Market on 19th and Mission streets is the perfect stop for lunch. My go-to on cold days are their homemade soups – vegetarians will be pleased to know that they can count on a meatless option. ). Lola: On some days, I have to have a burger and so it is Big Mouth for me, on others I need a bowl of pozole and for the moment my favorite is at Tacolicious.). When the sun goes down, the Mission goes out. For nocturnal inspiration check out our Events Calendar. But, let us recommend some always good neighborhood institutions to keep on your party radar: For shaking your tail feathers there’s Public Works for their frequent electro DJs and great live music, Elbo Roomʼs got frequent Soul and Reggaeton nights, and there’s no finer place to boogie to Afro-funk than Bissap Baobabʼs weekly Paris to Dakar dance party. The Mission has got a couple of really excellent and intimate venues for seeing live music such as The Red Poppy Art House and the Revolution Cafe. Recently opened, The Chapel occupies a former mortuary built in 1914 and features a well curated calendar of acts. The old stalwart, Amnesia – closed for renovation until 12/10 – has live music most nights of the week, featuring lots of folk and bluegrass. Brick and Mortar Music Hall also has a full calendar of great live acts. El Rio often has a fairly mixed and persistently inclusive crowd and its monthly queer dance party Hard French is one of the most exceptional Saturday afternoon soul parties around. The Day? 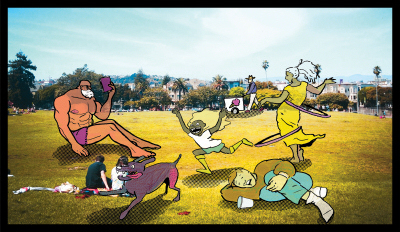 Dolores Park, though undergoing renovations until 2016, has a place for everyone. • MAPP – the Mission Arts and Performance Project, a kind of performance art crawl, happens every other month on the first Saturday of the Month. • The end of May means it’s Carnaval time. The two day festival features a parade of samba dancers and colorful floats. • Cinco de Mayo in May has a big street fair and performances. • For a neighborhood with a long proud tradition of activism, César Chávez Day in March gets its fair due. A weekend street fair on 24th Street with food and music celebrates the famous labor organizer. • Pride takes over the whole city in June. In the Mission celebrating LGBTQ Pride means hosting Dyke March and Trans March at Dolores Park. Here’s a sneak peek. 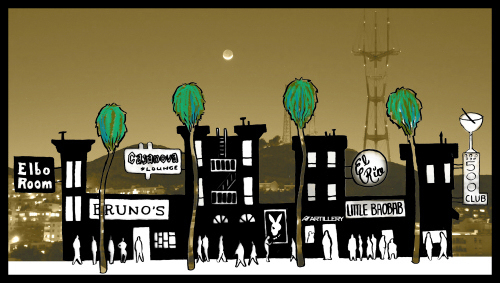 • Litquake’s Litcrawl in October has numerous readings in bars and shops along Valencia Street. It’s kind of like a pub crawl for literary nerds. • The Central American tradition Dia de los Muertos has become one of the neighborhood’s largest, most celebrated events. By October, residents are talking about the “muertos season”. In November, calaveras take over with a procession through the streets and a collection of altars set up at Garfield Square. In recent years, it’s also become a moment in which the neighborhood reflects on its changing character. It’s always slightly warmer here than elsewhere in the city, so dress for foggy days but prepare to shed layers when the sun is out. • Ok Corral to look like a vaquero. • Seigelʼs for all your Zoot Suit needs. • Retro Fit to look like Don Draper. • Artillery for locally made designs and hip Latin street style. • Self Edge for high-end, super premium denim. • Betabrand to look like a 22-year-old startup CEO. As any Mission longtimer will tell you, crime isn’t what it used to be in this part of town. Violent crime has generally decreased in recent years, but the occasional incident still happens… especially if you’re oblivious to your surroundings testing a new Selfie Stick in public on a shiny iPhone. 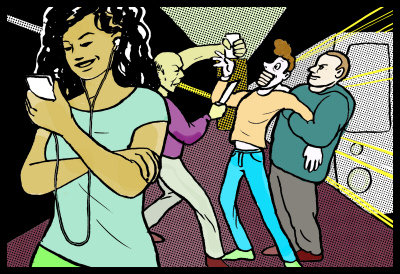 • Don’t pull your cell phone out at the BART Plazas or on Mission Street. It’s risky anywhere in the city, but just plain foolish in these locations. 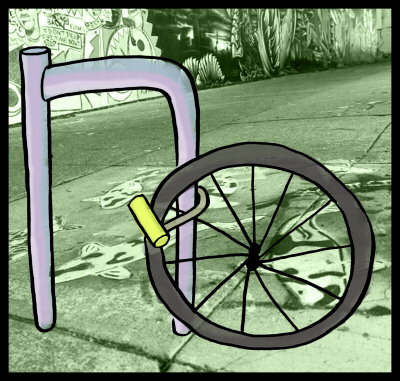 • Cyclists: triple lock your bike when street parking, follow all cyclist traffic laws and if you wear a helmet, we’ll still think you’re cool. 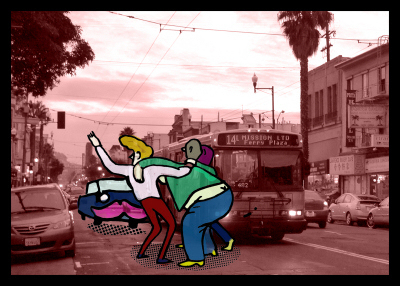 • Try to avoid being a total, sloppy drunken mess stumbling out of the bar on Saturday night on Mission Street. You’re not only asking for trouble, you’ll run the risk of being totally annoying. • For Pete’s sake, don’t wear Google Glass anywhere, ever. For frequent updates on the latest on crime, check out our aptly titled Trouble page. BMR: This acronym stands for “below market rate.” As part of San Francisco inclusionary housing law, housing developers need to include some plan for affordable housing units in new projects. Mission School: An art term used to describe a movement from the 1990s that started in the Mission, but seems to leave out the amazing Muralismo of the 70s and 80s, but that’s another story or maybe just another art term. SRO: Stands for Single Residency Occupancy, an SRO is a type of residency hotel that offers rooms with shared bathrooms and kitchens — some are run by nonprofits to provide affordable housing, others are for profit ventures. The Mission has many SROs. Ellis Act: Passed in 1985 by the California State Legislature, this measure was intended to help landlords go out of business but many believe it’s been used as a tool for landlords to evict longtime tenants and sell buildings to speculators. Google Bus: A catch-all term for all private shuttles run by Silicon Valley tech companies, objects of much derision and unrest. Formula Retail: A fancy way to say chain store, also objects of much derision and unrest. Super or Regular: When asked this puzzling question at a neighborhood Taqueria, just get Super. The extra buck is worth it for avocado, cream, and cheese. Copy: Daniel Hirsch and the Mission Local staff. Illustrations by Ivan Lopez and Steven Gong, Mission friends and artists who met playing soccer in Garfield Park. Layout by Claudia Escobar, a videographer, artist and baker. Web Adaptation by Cristiano Valli, journalist, handyman.